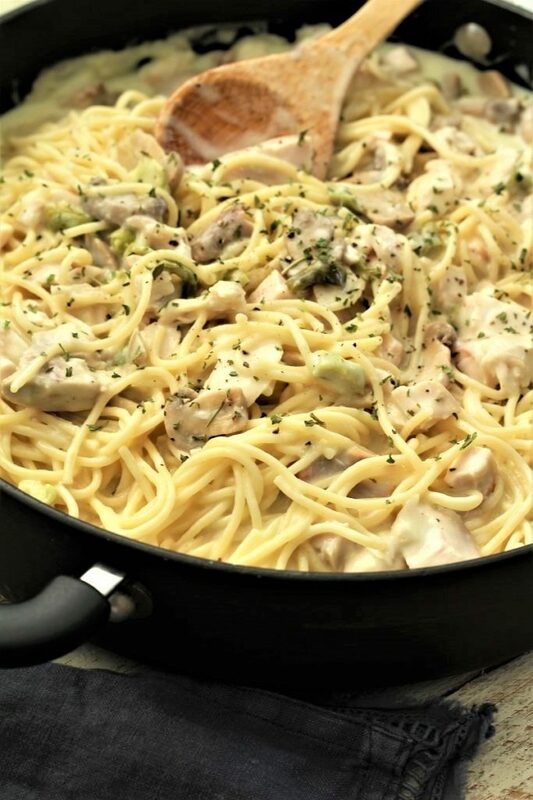 Turkey Tetrazzini is the perfect recipe for left over turkey. 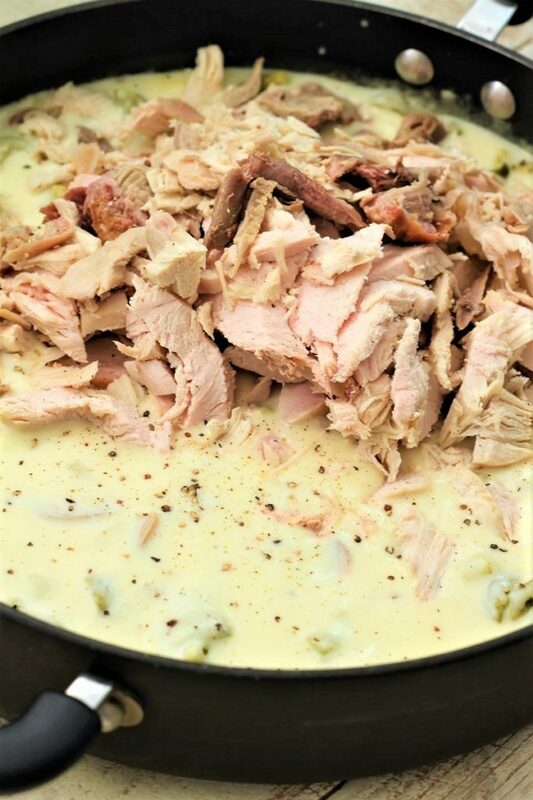 You will really wow your family and friends with Turkey Tetrazzini, and it comes together in about 20 minutes. It is creamy and loaded with flavor. Topped off with cheddar and parmesan cheese. I hope that you all really enjoyed your holidays. It seems like it took about three days to prepare the food, one hour to eat and one hour to do the dishes, and then it was over. It seems like time is going so fast, I can’t seem to keep up with all of the excitement going on. We did put a nice puzzle together after dinner and we played some games with the grand kids. That was a lot of fun. Then there was the shopping. A couple of my kids went because they needed to get things for their kids, but most of us stayed home. This year we decided to cook our turkey (spatchcock style). My one son told us that in 19 years of eating turkey, this was the best that he had ever eaten. It truly was nice and moist, and the white meat was as moist as the dark. We did luck out and we had extra turkey and so I decided to put it in this Turkey Tetrazzini. The outcome was a 10+! It is delicious. Wouldn’t you agree that sometimes leftovers are the best? I am always happy because it is one less thing that I have to do. However I do have a couple of children that do not like to eat leftovers, or one will eat one thing that is left over and the other will not. Hmm, I think that they should have grown up the youngest of 9 and if you wanted food, you better sit down, get some on your plate and enjoy, and if there were leftovers, it was a miracle. Ha ha. Turkey Tetrazzini is perfect because it comes together so quickly. 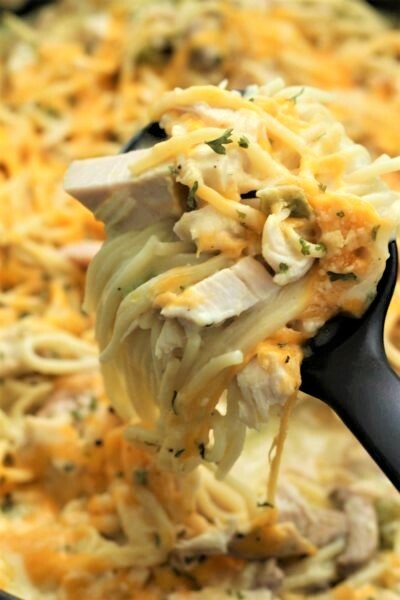 Cook your noodles, make your sauce and then put everything in the same pan except the cheese. Place the cheese on top, place it in the oven, and you are good to go. Okay, so I have to tell you this funny story about my sister. I was working and she was getting some leftovers. There was a bowl in the fridge that had some left over waffle batter in it. She put her potatoes and corn on her plate. Then she got out the gravy, or not, actually it was the waffle batter, she warmed it all up and then she started to eat it when my husband comes out and he says, “you know that is not gravy right”? And my sister was thinking to herself man, this is really good potatoes and gravy. Ha ha. Then she stopped and thought about it and then she realized that it really was waffle batter. Then I do not think that it tasted as good. That is almost as good as the year I put paprika on the potatoes to make them look all beautiful. Weren’t we all surprised when we found out that it really was cayenne pepper! I had grabbed the wrong jar and boy were those some hot potatoes. Reminds me of the game, hot potatoes. Ya, well, I tried to scoop most of the top off so that everyone else didn’t have to suffer. Another thing that we tried to do was to tell some of the things that we are grateful for and we made it through 3 people before something crazy happened and then that was the end of that. I hope that we can be a little more organized for the Christmas party! Speaking of Christmas parties, my friend has a Christmas party every year. They have this lizard that is a fertility lizard. If you get the lizard, it is a guarantee that you will be coming to the party. They do a white elephant exchange, and one person has to bring the lizard. I couldn’t remember if I had the lizard or not. My friend texted me and said, do you have the lizard? I told her no and went about my day. And then, I just couldn’t get it out of my mind and so I called my oldest daughter and asked her if she thought I had it, because she was living with me last year at the time. She told me “yes, I think you have it and I think that you put it away in with your Christmas stuff”. So I started looking and my husband thought I was crazy. He said, “I think that you just want me to get the Christmas decor down”. And you know that is a pretty good idea since Christmas is less that a month away. Anyway, the second box that he looked in, there was the lizard. So I texted her back and told her that I had forgotten that I had the lizard and she could go on with the planning of the party. Let me tell you, it is not really very fun to get older and forget things. And my husband is the same way. 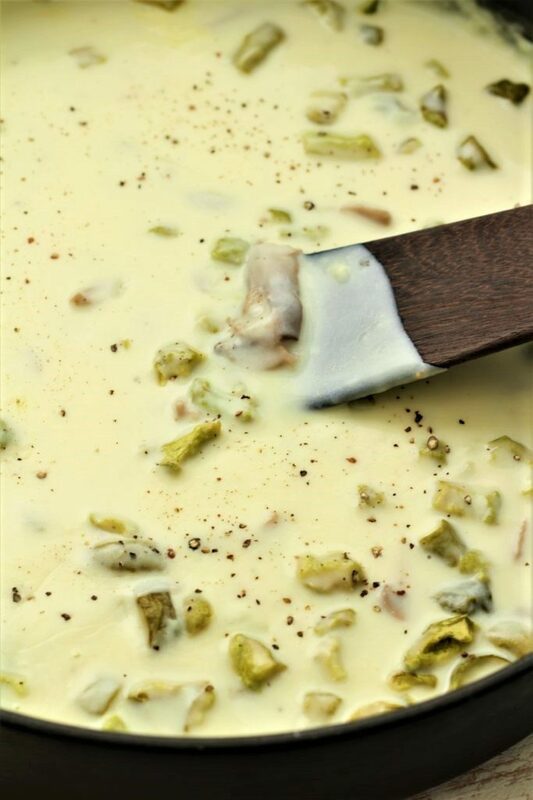 So here we are, making Turkey Tetrazzini and I am so grateful for the blog, because that way, I can remember my recipes and my kids and grand kids can too. 1- If you do not have a large skillet that you can place in the oven, just use a 9″ x 13″ baking dish and cover it with foil after you put all the ingredients together but the cheese. 2- I used 1/2 grated parmesan and 1/2 shredded, but you can use whatever you like. 3- I only had heavy cream and so I used 1/2 cream and 1/2 milk. 4- I also garnished the Turkey Tetrazzini with dried parsley. In a large pan cook the spaghetti noodles according to package directions. In a large skillet, melt the butter and add the flour, stir until it starts to thicken. Then add the broth, cream, salt, pepper, mushrooms, minced peppers, cooked spaghetti noodles, and cooked turkey, or chicken. I leave mine in the skillet and add the cheeses, or you can put it in a 2 - 3 quart casserole dish. Whichever one you use, place the lid on and put it in a preheated oven @ 350 degrees, for 30 minutes. Makes me wish I had leftover turkey!! This looks like a fabulous dinner!!! Thank you Kelly, I should have doubled it. My family gobbled it up! Wowser I’m totally drooling! Thanks for joining us at the To Grandma’s house we go link party, see you next week! Thank you for coming by. We will see you next week!